We encountered the well-known figure in his extraordinary skull-cap, decorated with military greatcoat closely buttoned to the throat. Martin, with exaggerated politeness, drew his feet together, bent forward, lifted his tortoise-shell hat high in the air, and answered "Gratified to meet you, sir! I am the philosophical conquerer of all nations, this is what I am! and this is my badge”; at the same time unbuttoning his greatcoat he showed a medal as large as a saucer, which was hung round his neck by a ribbon. It was not a medal at all, and he was manifestly crazed, yet he had that about him that made one treat him with respect. A noble presence even was his, although he was poor enough to sell his pamphlets thus on the street, which pamphlets were of course only evidence of his craze. [engraving from a drawing by William Westall], Edward Finden, 1830. 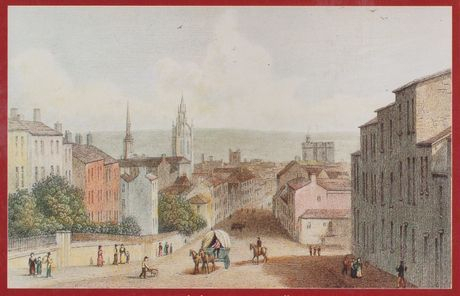 William Bell Scott, poet, artist and master of the School of Design in Newcastle, described a chance meeting with William Martin, on the streets of Newcastle in the 1840's. William, at the time in his 70's, was nearing the end of an extraordinary career which had seen him budding as a philosopher, a poet and an inventor. As Bell Scott testifies, William was wearing on his head a tortoise shell and the breast of his overcoat was festooned with a great many 'military' medals, most of them apparently presented to him as a joke by Newcastle's Quayside clerks and regarded by William as genuine. In fact, William had become the subject of great ridicule. Who indeed would have believed that a quiet and innocent place such as Tow-house, near Bardon Mill, Northumberland, could have spawned one of Tyneside's greatest characters?